Catalonia, located at east of the Iberian Peninsula along the Mediterranean Sea, is a relatively small country with more than a thousand years of history, where culture and language have shaped much of its indisputable personality. 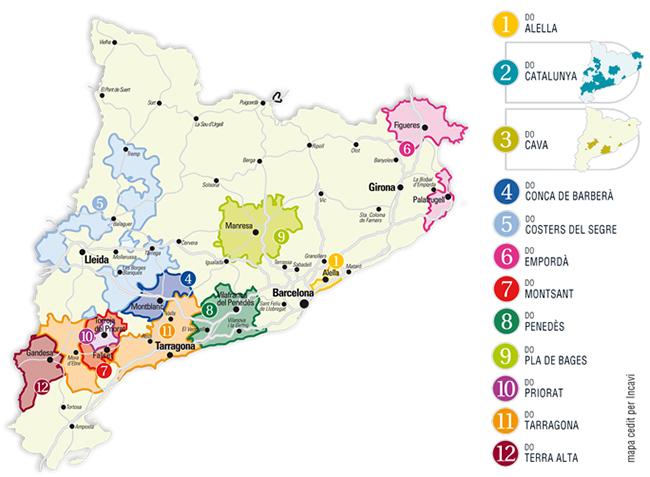 Within wines, Catalonia is the second largest Community producer of wine of our country and the one that encompasses more Appellations of Origin, which it makes nowadays a large field of experimental techniques, methods and grape varieties, and where wine developments arise sporadically, harvest after harvest, in any of its twelve appellations of origin. Here we could find some wine regions par excellence and with a great degree of development of an important agricultural economy, but there are also other smaller regions with a remarkable historical past and now with a much more promising future.